What Was the Baekje Kingdom? The Baekje Kingdom was one of Korea's so-called "Three Kingdoms," along with Goguryeo to the north and Silla to the east. Sometimes spelled "Paekche," Baekje ruled over the southwestern part of the Korean peninsula from 18 BCE to 660 CE. Over the course of its existence, it alternately formed alliances with and fought the other two kingdoms, along with foreign powers such as China and Japan. Baekje was founded in 18 BCE by Onjo, the third son of King Jumong or Dongmyeong, who was himself the founding king of Goguryeo. As the king's third son, Onjo knew that he would not inherit his father's kingdom, so with his mother's support, he moved south and created his own instead. His capital of Wiryeseong was located somewhere within the boundaries of modern-day Seoul. Incidentally, Jumong's second son, Biryu, also established a new kingdom in Michuhol (likely today's Incheon), but he did not survive long enough to consolidate his power. Legend says that he commited suicide after losing a battle against Onjo. After Biryu's death, Onjo absorbed Michuhol into his Baekje Kingdom. Over the centuries, the Baekje Kingdom expanded its might as both a naval and a land power. At its greatest extent, around the year 375 CE, Baekje territory included approximately half of what is now South Korea, and may have even reached north into what is now China. The kingdom also established diplomatic and trading relations with the early Jin China in 345 and with the Kofun kingdom of Wa in Japan in 367. 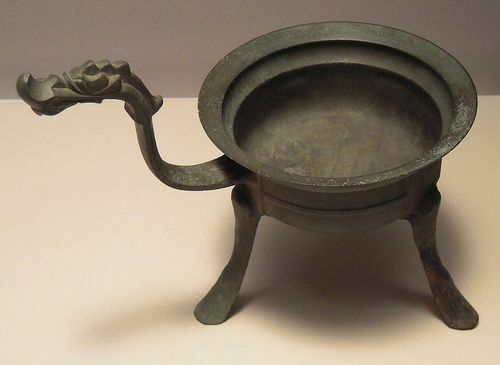 During the fourth century, Baekje adopted many technologies and cultural ideas from the people of China's first Jin Dynasty. Much of this cultural diffusion took place via Goguryeo, despite fairly frequent fighting between the two related Korean dynasties. Baekje artisans in turn had a profound effect on the arts and material culture of Japan during this period. Many of the items associated with Japan, including lacquered boxes, pottery, folding screens, and particularly detailed filigree style jewelry, were influenced by Baekje styles and techniques brought to Japan through trade. One of the ideas that was transmitted from China to Korea and then on to Japan during this time was Buddhism. In the Baekje Kingdom, the emperor declared Buddhism the official religion of the state in 384. Throughout its history, the Baekje Kingdom allied with and fought against the other two Korean kingdoms in turn. Under King Geunchogo (r. 346-375), Baekje declared war against Goguryeo and expanded far to the north, seizing Pyongyang. It also expanded south into the former Mahan principalities. The tides turned about a century later. Goguryeo began to press southward, and captured the Seoul area from Baekje in 475. The Baekje emperors had to move their capital south to what is now Gongju until 538. From this new, more southerly position, the Baekje rulers solidified an alliance with the Silla Kingdom against Goguryeo. As the 500s wore on, Silla grew more powerful and began to present a threat to Baekje that was just as serious as that from Goguryeo. King Seong moved the Baekje capital to Sabi, in what is now Buyeo County, and made concerted efforts to strengthen his kingdom's ties with China as a counter-balance to the other two Korean kingdoms. Unfortunately for the Baekje, in 618 a new Chinese dynasty, called the Tang, took power. The Tang rulers were more inclined to ally with Silla than with Baekje. Finally, the allied Silla and Tang Chinese defeated Baekje's army at the Battle of Hwangsanbeol, captured the capital at Sabi, and brought down the Baekje kings in 660 CE. King Uija and most of his family were sent into exile in China; some Baekje nobles fled to Japan. The Baekje lands were then assimilated into Greater Silla, which unified the entire Korean Peninsula.